We were excited to launch our new Advent Challenge for 2017. Like Advent Windows and The Most Unusual Christmas Tree Festival Ever, this community based outreach invited everyone in Toton to think about the real meaning of Christmas. 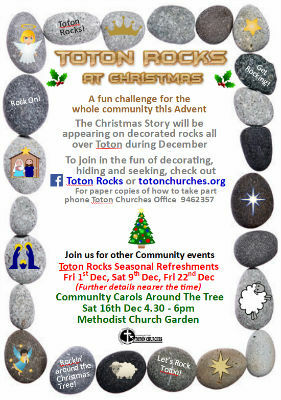 Christmas Rocks were hidden in public places all over Toton between 1st and 16th December. 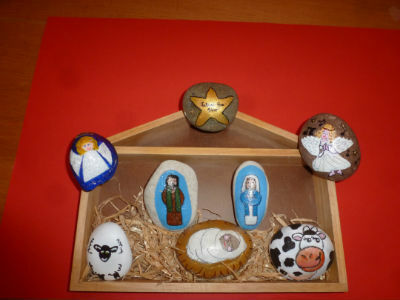 The challenge was to find a full set of symbols before Christmas Day. Toton Rocks at Christmas started on Friday 1st December 2017 with a Toton Rocks Hunt on Manor Park . Similar events took place at Top Park on Saturday 9th December and on Spinney Crescent on Friday 22nd December. Families came any time between 6 and 8pm. to hunt for rocks, rock swapping and seasonal refreshments. Please pray that people will continue to find Jesus throughout 2018.